Ancol Acticat Plastic Playground is the ultimate play station for your cat. 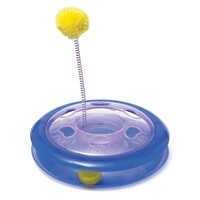 The translucent ball track provides fun while your cat chases the ball around. The pompom toy has a spring motion for additional fun. The Plastic Playground is a supervised toy ideal for you and your pet to interact and enjoy together. It is recommended that you supervise your pet while playing. Do not leave this toy alone with animals that may eat toys. I got this for my cats,they are indoor cats brother and sister,Thomas has urinary tract problems,the vet says needs excercise.Thomas has been playing with it since it came out of the box,enjoys trying to get the ball.Yet the laser dart toy I got for him,he rarely chases the light.He seems to be working out where is it coming from.The vet said cats have mechanical working minds.This playground seems more attractive to him.I am happy with his reactions to it.and not expensive to buy.satisfied with it. bought this for my boys, Jet & Nibbles, and they play for HOURS with it!! Strangely the don't bother with the ball on top but the one inside,the pair of them sit flicking it to each other! !Superb value for money and great entertainment for my boys!